Divine Bond is pretty well a classic Archetype in the game, The Ironcliffe Guardian into Divine Bond combo has been around from the start of the game and is an easy way to deal a huge chunk of damage to an opponent who cannot answer a huge HP minion. This list is just my take on what a budget version could be like. I’m not the expert on Bond lists by any stretch, but the basic plan is to keep putting your opponent in tough situations where they have to answer you minion or lose a great deal of their HP from a possible Divine Bond. You force them to answer repeatedly these large threats until eventually one sticks and you then get to stomp them into the dirt. There’s very little removal in the deck so watch out for value generators or backline threats if the enemy gets space to deploy them. In my list I’ve made a couple of choices inspired from my Zeal Brome Build that I liked from playing it and thought ported over fairly nicely to give a few more great targets. The list should play out as more of a midrange list with a large burst finisher. Some Decks run fewer numbers of these, but I figure improving players will appreciate seeing their win con a little more, especially when the gameplan is pretty simply to drop a big boy and then buff it for huge damage. The main bond target of the deck lock the enemy down so they cannot escape easily. If they survive in good condition through the enemies turn that’s usually the green light to buff them up and swing away. The Airdrop on Ironcliffe is also a super tool for positioning it to give the enemy greatest trouble in answering it, or even to reach an otherwise inaccessible target like some backline ranged minion. As I mentioned earlier I enjoyed playing these a couple of months ago, and they are decent additions to a bond list, they both give ATK & HP buffs which can mean an even bigger burst on your Divine Bond turn, and the Possibility to give certain minions spell Immunity mean that the enemy can have fewer possible answers to deal with a minion that has, or threatens to get, a huge Attack buff off of Bond. Most of the Zeal crew made it back, Gryphon Fledgeling isn’t quite as good of a fit in a deck that wants to have larger HP pools and did not this time allocate budget for Holy Immolation. All the above cards are just good units that you’ll be happy enough to see in an average game, but of course benefit from the above ‘Zeal matters’ spells when you get to use them together. Additionally some of them are good to great as Divine Bond targets, especially when they have already used the Zeal buff spells on them. I will round out my 2 drops with these guys, I mentioned it before but Azurite Lion having Celerity makes it a great buff target. An undamaged Lion with Bond deals ten damage in a turn, but if you play an Afterblaze before that you’re in the money with an impressive twenty two damage, ouch. Lion is also just an excellent 2 drop to open with it’s extra mobility allowing for safer or smarter positioning to put threat on the enemies and the space available to them. Sun Wisp is just nice to have to draw into your good cards. Some removal to the deck. Playing without Tempest feels really hard in this meta to be honest, so even if it’s not an ideal fit I include it. Sentinel is nice for sniping off enemy minions and still having a body to fight with and put buffs onto if needed. It’s always good to recommend Oath and Immo to Lyonar players as both those cards are fantastic additions to most of their decks. If you are really enjoying the Bond playstyle then War Exorcist can be a situationally good addition, though some players don’t love it. 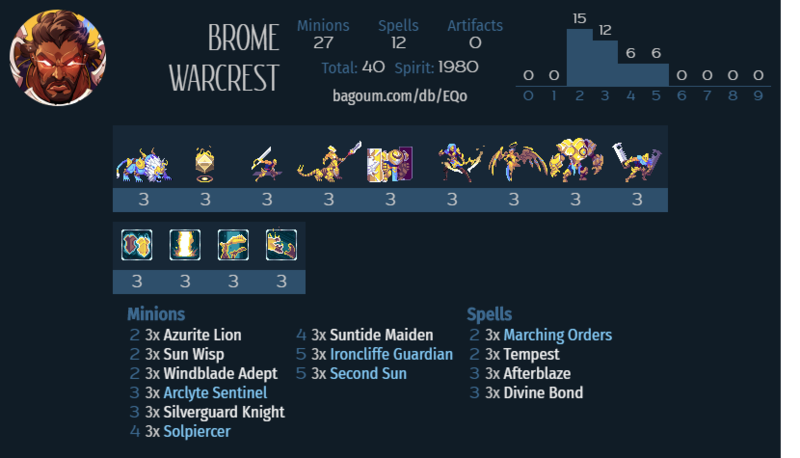 The “Zeal Brome Build” link is to a page that’s no longer available.